Virtualization is the hot technology in the enterprise today. From cloud computing, virtual desktops, to simple consolidation efforts, virtualization is having a profound effect on how enterprises are deploying and managing their infrastructures today. With the introduction of virtualization into the enterprise come not only the great benefits, but the need to understand how to properly secure and configure the virtual infrastructure to comply with the various regulatory requirements that enterprises face. 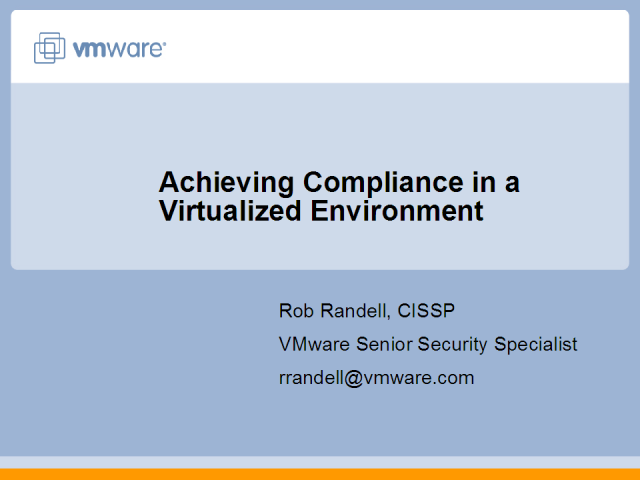 In this presentation, Rob Randell, Senior Security Specialist from VMware will discuss these issues and what you need to think about to ensure compliance with these various regulations.